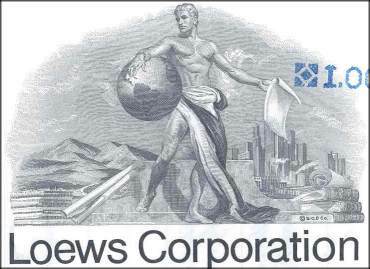 Beautifully engraved certificate from the Loews Corporation issued in 1973. This historic document was printed by the Security-Columbian Banknote Company and has an ornate border around it with a vignette of an allegorical man. This item has the printed signatures of the Company’s Chairman of the Board (Lawrence Tisch ) and Secretary and is over 29 years old. Loews Theatres was founded in 1904 by Marcus Loew in Cincinnati, Ohio. Loew, a young fur processor from New York City, set up a nickelodeon in a rented store that soon became one of the most successful enterprises of its time. In an attempt to provide film entertainment for his growing business, Loew returned to New York City and joined forces with Adolf Zukor who had imported the first feature length film, Queen Elizabeth; Zukor went on to become the founder of Paramount Pictures. In the years immediately before World War 1, Loews circuit grew from coast to coast. In order to supply his theatres with new film product, Loew purchased an ailing silent movie production studio named Metro Company. In 1924, Loew merged the Metro Company with Louis B. Mayer and Samuel Goldwyn to form the first Loew subsidiary, Metro-Goldwyn-Mayer. With film supply secured and the publics love for Hollywood entertainment assured, Loews Theatres grew throughout the 1930s and 40s. In 1954, in an effort to prevent monopolies, the United States Government ordered that Loews Theatres and MGM must become separate business entities. Loews expanded into more suburban markets in the 1950s, 60s and 70s. In October 1989, Sony USA purchased the parent company of Loews, Columbia Pictures Entertainment, Inc., now the Sony Pictures Entertainment Company. During this same period of time, Loews embarked on an aggressive theatre expansion program and effectively doubled its size. Today Loews Theatres, a Sony Retail Entertainment company, operates 1020 screens in 141 locations (including its affiliate circuits, Start Theatres and Magic Johnson Theatres) in 16 states and continues to expand with the intent of further enhancing its position throughout the region in which it operates. 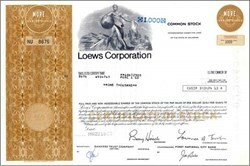 This certificate has the printed signature of the company's chairman, Lawrence Tisch of CBS fame.